Yema Bread Rolls with soft, fluffy bread and creamy yema filling are the ultimate snacks. Enjoy for breakfast or anytime you need a sweet treat! I love baking and most often than not, you’d find me in my kitchen baking up batch after batch of both sweet and savory baked goods. I truly enjoy the whole creative energy of making a fresh loaf from scratch and the fact that the whole house smells like a cozy bakeshop is an added bonus. These yema bread rolls are made with a dough recipe I use in a lot of my bread creations. I’ve worked with all sorts of dough but this one is my favorite to use as it yields super soft, delicate buns that lend well to various fillings. 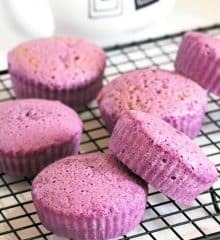 Although I’ve had scrumptious results with different fillings such as ube and coconut jam, these custard buns are hands down the best of the lot in my opinion. With the sweet and creamy yema nestled in pillowy bread rolls, every bite is a delicious surprise! The prep time for these yema bread buns is about 1 hour excluding the rise and chill time for the dough but don’t let the seemingly complex process and the hours involved daunt you. I promise they’re worth the effort! The right temperature of the milk is crucial for proofing the yeast so make sure to heat your milk to the optimal temperature of 105 to 110 F. Remember that yeast is a living organism and very hot liquid will kill it! If the yeast mixture does not foam after 20 minutes, the yeast is probably “dead” so discard the mixture and start with a fresh pack. The dough will be very sticky initially but once you add the melted butter, it will be soft, smooth and easier to handle. When filling the buns, keep the yema in the center of the dough and leave about 1/2 inch border as any smears on the sides will make sealing the dough difficult. You can also simplify the process by making the dough and the yema in advance. The dough after it has risen can be refrigerated for up to two days and the yema filling will keep for up to three days. On the day of baking, just assemble the buns, let them rise, and bake! Drain the potatoes and mash with the 4 teaspoons of milk until smooth. Set aside. In a medium saucepan over medium heat, add condensed milk, 4 tablespoons of the mashed potato, and the remaining egg from the dough ingredients. Stir the mixture constantly until thick and spreadable, about 15 minutes. Allow to cool. Grease a 9 inch round pan with melted butter. Set aside. Deflate the dough by lightly kneading and divide into 15 portions. Lightly flour your hands and work surface as needed. Roll each portion into a smooth ball and then flatten with your palms until it is about 1/4 inch thick. Spoon about half a tablespoon of the yema filling on the center of the flattened dough. Fold and stretch the edges of the dough over the filling, then pinch the end while twisting it slightly to seal. Repeat with the other portions. Arrange the filled dough on the greased baking pan seam side down. Space them close to one another. Brush with melted butter and cover with a lightly buttered plastic wrap. Let rise for 1 1/2 hours. Place your rack in the lowest position inside the oven. Preheat oven to 400 F.
Set the baking pan on a baking sheet and place in the oven. Bake for 5 minutes, then lower temperature to 375 F. Bake for another 15 minutes or until the top of the buns are nicely golden. These sound so good! I wish I could make everything right when I make these. Thanks for sharing, Lalaine! what kind of potato needed for the yema? sweet potato? yukon? purple yam? What kind of flour did you use, bread or all purpose flour? Thanks. In the yema bread roll I don’t see when I can use the 3rd 2 tablespoons of melted butter. i still have my dough rising as I am typing this. Help. Thanks.